Washington, D.C. is a city that knows what it wants and is willing to wait to get its way. Case in point: the line outside of Rose’s Luxury forming earlier and earlier on any given Tuesday evening, or the hordes of salivating sweet toothers who haven’t ceased to queue outside Milk Bar since its arrival in late October. The latest object of desire is a 19th-century row house now turned into a 55-seat restaurant in Blagden Alley, the Shaw neighborhood’s hidden gem. For two years the city waited with baited breath for chef Jeremiah Langhorne to finally throw open the doors of The Dabney and say “welcome.” Anticipation had been building since Langhorne left Charleston, S.C. in 2013 amid rumors that he was returning to his hometown to open his own restaurant. On Halloween, Washington finally got its collective wish granted when the first piping hot buttermilk biscuits with foïe gras, apples, maple and country ham were served. But the story behind The Dabney, named for Langhorne’s prominent Virginia family and honoring his Mid-Atlantic roots, really starts more than a decade ago when the now 29-year-old chef was just a 16-year-old kid working as a pizza delivery boy. After a quick chat with the pizza shop’s owner about his new-found fascination, Langhorne realized that if he was serious about cooking he needed to move on to a new restaurant. Once he was introduced to chef John Haywood (formerly of Charlottesville’s beloved OXO), Langhorne started down a long and dedicated path of staging (culinary speak for interning) while balancing multiple jobs and trying to fulfill his quest for learning. After a few twists in the road, including one winter spent as a ski bum in Crested Butte, Colo., Langhorne found himself working under the man who would become his greatest mentor, Sean Brock, at McCrady’s in Charleston S.C. Langhorne spent five years honing and fine-tuning his talents there, working his way up from line cook to chef de cuisine. Though the decision to leave and set out on his own was not an easy one, Langhorne says he knew it was time when he realized “there was never going to be another Sean” and that it was time to start molding his own identity. But the moment the word got out of his departure, the pressure started to mount. Finding exactly the right space to fit his very detailed vision was one of the hardest parts of the last two years. The chef, who often finds himself poring over vintage cookbooks, says his goal for The Dabney dining experience is to transport guests out of their everyday routines in the city and take them on a journey somewhere else. 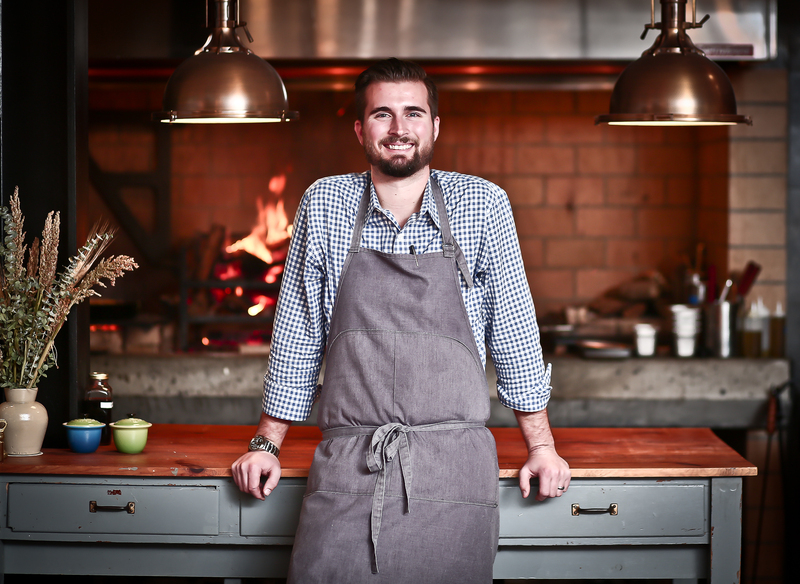 The cornerstone of that experience became his 10-foot wood-burning hearth, where he plans to roast or smoke much of his Mid-Atlantic-inspired cuisine. The Dabney’s menu changes almost daily as Langhorne, just like Brock, has “a complete and total respect for local ingredients,” which means only using what is at peak in the region on any given day. That might be a “whole fried porgy” with a side of grilled cabbage cooked in duck fat one day and seared golden tilefish and cauliflower soup the next. One thing you should never expect to see in Langhorne’s kitchen? Unhappy faces.